Before I was halfway finished with Locomotion, I added it to the Amazon wishlist for my former school in The Bahamas. This is a book that the students there will adore (feel free to donate it, wink wink). Lonnie Motion, better known as Locomotion, has experienced a lot of upheaval in his eleven years. After his parents' died in a fire, Lonnie and his sister were passed around until they were finally placed in two separate foster homes. 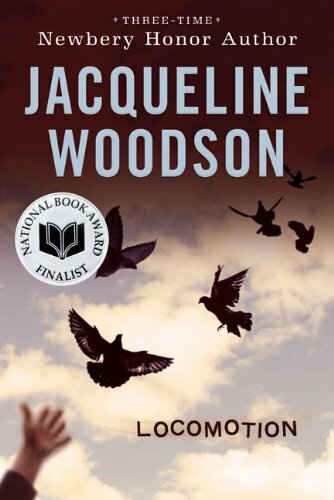 Written as poems, Jacqueline Woodson explores Lonnie's feelings about his family, classmates, religion, and other parts of life. Insight like this makes Locomotion a surefire addition to my classroom library. Even better, there is a sequel called Peace, Locomotion. Love the poem about poems. Anyone who's ever written one can only nod their head in agreement to what's "really great/ and really stupid/ about poetry"!